She starts her day in Physical Education and Sports, with Ms. Miller. Ms. Miller maintains the class well, and the students all know to listen to her. Katherine said that they are learning football right now and she thinks she's getting the hang of it. When I asked her about the activity she likes the most, she said she is "Very excited for ultimate frisbee at the end of the year." Second period is Math 8/7 with Ms. Bhattacharya (who has been subbing for Ms. Small). 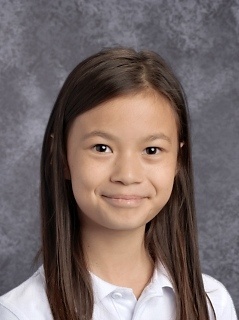 Katherine said that math so far has been review of the material she learned over the summer, so she feels very comfortable with the arithmetic they have been working on. Math is one of her favorite classes, but to be fair, it's a six way tie at the moment. Next, she heads to Introduction to Science with Mr. Archambault. The class always starts with Bell Work (a quick assignment at the start of the class), and then they move into the topics they are working on for the day. The class just took a quiz on variables, controls and constants; basically how to properly run experiments. Katherine is feeling good about her quiz, "I finished my study guide, so I was ready." She has a lot of fun in Intro to Science, and mentioned something that everyone on campus knows-Mr. Archambault is a HUGE fan of super heroes and comic books. "They are often a big part of examples in problems." Katherine working through a crossword puzzle featuring aspects of the metric system with her class during Bell Work time. It's lunchtime! Katherine always eats her lunch with her best friend Olivia. Lunch falls in the middle of the school day, and so each lunch period is the same as a class period: 50 minutes with a 5 minute passing period on each end. They like to relax during lunch, and take the time to talk about how their day has gone, and what is coming up in the afternoon. After lunch, her schedule can be a little bit different depending on the day of the week. She either has Latin or Classics during period 5. Today she has Latin, which is a brand new subject for her, and has quickly become one of her favorite classes. One reason she loves Latin is that she enjoys making flash cards. Another reason she enjoys Latin, is that her dad can read and write the language pretty well. Her goal is to be better than him, but she knows that she has a way to go as he's pretty good. They are reading Minimus as a class, and Dr. Green is helping them translate and learn vocabulary. The first word she learned in Latin is sum, which means I am. If she doesn't have Latin, she goes to Classics with Dr. Van Dusen. They are learning about the Ice Age right now, she was so surprised to learn that the Sumerians had clean water as they didn't have what we would consider technology. "They built canals, learned how to irrigate plants, it's amazing!" she explained. Katherine went on to say that Dr. Van Dusen shares lots of resources, so it's easy to keep track of all of the information they are learning. Her next class of the day is Music. All students in grade 5 take both Music and Visual Arts during the school week. Currently in Music, they are learning about the different types of instruments. She likes her teacher Mr. Wolf as he is very patient. Katherine plays the piano outside of school, and doesn't really want to learn a new instrument as it would add her to her homework load. She is enjoying learning about her options though. On days she doesn't have Music, she goes to Visual Arts with Ms. Jones. Ms. Jones is very helpful, and always takes a lot of time to explain new projects as they start them. Katherine enjoys Visual arts as it's relaxing for her. They are learning about the color wheel, of which Ms. Jones has lots of details to share. Katherine's period 7 class is English with Ms. Srivastava. This is one of her favorite classes but is also the biggest challenge for her. Ms. Srivastava happens to be her absolute favorite teacher, which is helpful as Katherine feels most comfortable when she is able to ask additional questions, just to make sure that she understands the concepts. 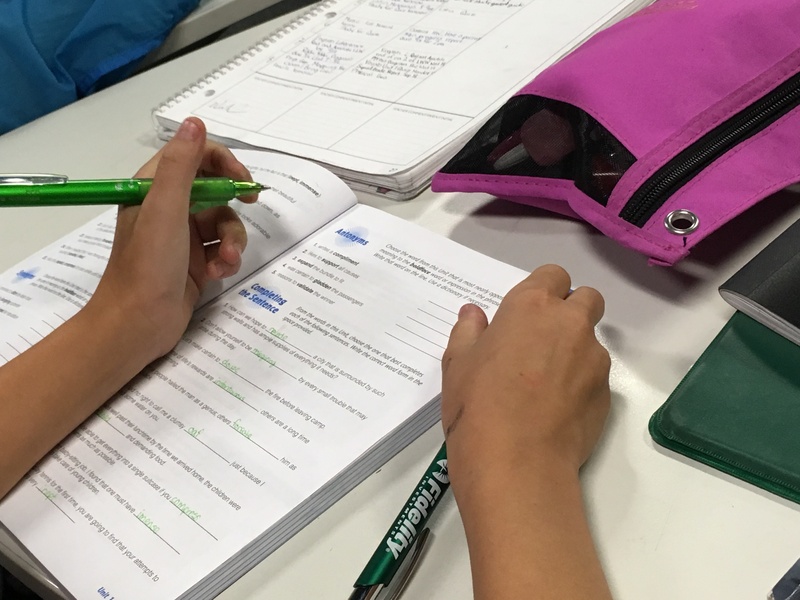 When I joined her in class, they were working on one of her favorite activities-going through their most recent vocabulary assignment to prepare for an upcoming quiz. When they aren't learning about grammar or vocabulary, they work on assigned readings and complete annotations. Most recently they read A Summer in a Day, and have just started Rikki Tikki Tavi. A Summer in a Day was her favorite of those two readings because she was fascinated by the subject matter and had a lot of logistical questions about how the students got to Venus in the first place. Katherine ends the day in Physical Geography with Mr. Ryan. She thinks it is a really fun class, and especially if you model good behavior. They have learned about the continents and oceans so far, and she is proud that she can recognize all seven continents and five oceans. I asked Katherine if this class has helped her in her personal life and she explained that she has done a lot of traveling, and was excited to add that "I can pick out some of the places I've been on maps!" Katherine has a lot of logistical advice, particularly about binders and lockers. She has found that it's better to have larger binders for multiple subjects rather than lots of individual ones. "Lots of small binders won't end up fitting in your locker," she explained. Speaking of lockers, Katherine suggests that it's best to definitely measure yours before you by any of the organizers. "And, it will take about a week to figure out the lock, then everything is OK."
Grade 5 is always a brand new class at BASIS Independent Silicon Valley, with all of the students joining at the same time. This can be very helpful for making friends as everyone is new together. Katherine was lucky enough that her best friend from her old school also applied to BISV and enrolled, which made it an easier transition for both of them. "It was perfect, it's really fun to have a friend the first day, but there are also lots of new friends to be made. All the kids are new together, so we're all in the same boat. No bragging rights because everyone is learning everything together." 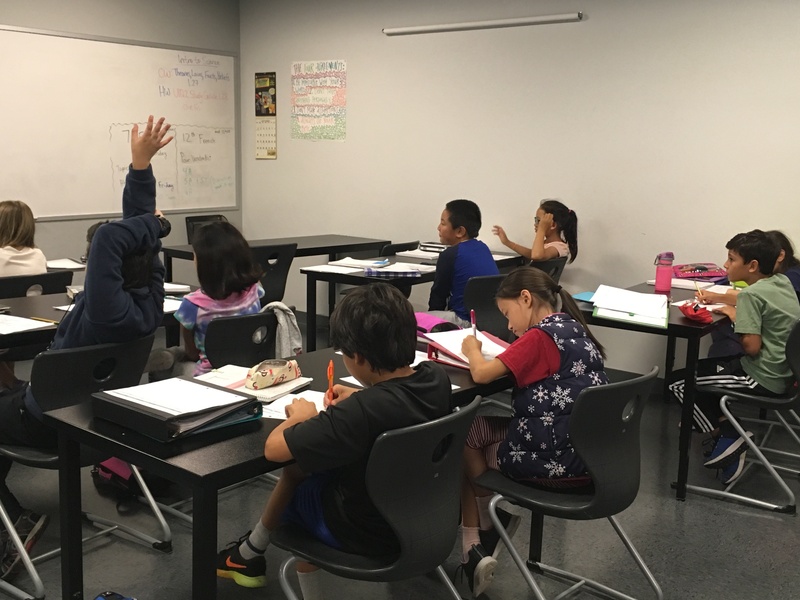 Interested in learning more about the middle school curriculum at BASIS Independent Silicon Valley? Please do so here. Our application for grades 5-10 for the 2019-2020 academic year is open! Please sign up to be on our interest list, or apply here.